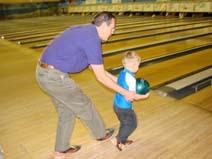 Good old fashioned bumper bowling is fun for kids and is a great way to spend the afternoon with the ones you love. With the bumpers up, the pressure is off. Even mommy can get a chance at a good score!! Bryan had a great time at Coquina Lanes in Palm Coast, during Customer Appreciation Day. Games were only $1 each, as well as shoe rentals! Bryan loved to see all those pins get knocked down! Do you remember when we had to use pencils and write in our own bowling scores?